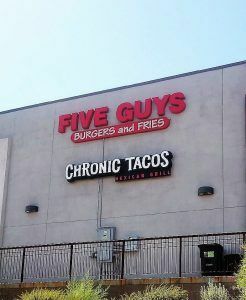 When Chronic Tacos opened their second Las Vegas restaurant, they came to us to help them advertise their new location with some brand new signage. They had a temporary “Now Open” banner up, but they wanted permanent signage to display their well-known logo. 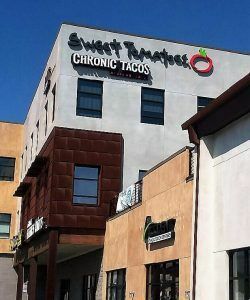 We have worked with many Chronic Tacos locations and for each one, we use impressive LED-powered compound channel letters to help with their branding and advertising. They needed a total of three signs to be made. One for the storefront, one in the back for the parking lot, and another for the side of the building for maximum advertising. Channel letters are large, 3-dimensional letter signs. We make them custom, in-house so we can recreate any font or logo shape you use for your branding. We start by shaping the returns, which are the sides of the letters, into the outline of the letters. For front-lit or compound channel letters, we make the returns 5″ deep. This is for the LEDs which we’ll go into later. Since the letters “CHRONIC TACOS” are always white for all of their marketing, we simply used white acrylic for the faces. We make the channel letter faces by routing out the letters from the acrylic. We then attach the trim cap to the border of each letter. A trim cap is the plastic molding that attaches the acrylic to the aluminum returns. We used a black trim cap to match the color of the returns which were painted black. The difference between front-lit channel letters and compound channel letters is that compound channel letters are also reverse-lit. 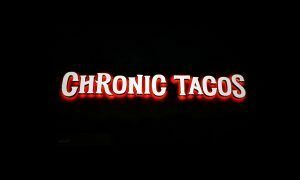 More specifically, the signs we make for Chronic Tacos are always compound channel letters with different colored LEDs in the back than in the front. The way we do this without having the different LED lights bleed into each other is by putting a thin piece of aluminum in each letter to section off the front and the back. The white LEDs to illuminate the faces are installed in front of the aluminum facing forward and the red LEDs are installed behind the aluminum and face the wall. The back of each channel letter is made from a clear UL listed acrylic called Lexan which allows the red light to shine through. We mount each channel letter spaced off of the wall by 1 1/2″ inches so the red LEDs have room to illuminate. Lastly, “Mexican Grill” is cut out from 1″ thick red acrylic and are installed with 1/2″ spacers underneath ‘CHRONIC TACOS”. The signs look great and are sure to help attract new and existing customers.